This blog post is part of our Customer Spotlight series. Throughout the series we highlight Chargify merchants and the lessons learned as they grow their subscription-based businesses. While traveling the world is a dream for many, time and money restrictions often stand in the way of getting on a plane and discovering exotic destinations. Try The World recognized both the dream and the restrictions, and they’ve figured out a way to deliver a part of the world travel cultural experience right to your doorstep. What began as a monthly subscription box featuring 7 – 8 products from a specific country has expanded to additional subscription box offers, an online store, magazine, partnership with Jet.com (a subsidiary of Walmart), and more! Only a few years old, Try The World has seen 80% growth year-over-year and they’re just getting started. Recently, the company was named #3 on Crain’s Fast 50 fastest growing companies in New York City. We sat down with co-founder Kat Vorotova to talk about Try The World’s success, lessons learned as they grew, and their advice for other subscription service companies wanting to experience similar growth. Try The World was born out of a shared passion for food and travel. Co-founders Kat Vorotova and David Foult met at Columbia University in 2012 when they were both working on graduate degrees. Prior to starting her MBA, Vorotova’s background was in consumer and strategy consulting. 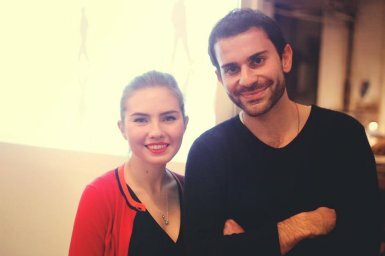 An avid traveler, Vorotova ran a food blog on the side of her full time job where she shared unique international foods that could be found in New York City for an international experience without boarding a plane. She regularly received emails from readers from all over the U.S. wishing they could try dishes profiled on her blog, but lamenting the foods weren’t available in their area. Also passionate about travel, Foult’s background is in finance and entrepreneurship. Previous experience included launching a micro-finance company in Vietnam, where he helped entrepreneurs and farmers grow their businesses. There he came to realize the variety of challenges the business owners faced and their need for additional support, beyond access to capital. Foult had also been involved in a European startup which promoted brands wanting to break into the European market via pop-up store solutions. Vorotova points to increased diversity among U.S. consumers: diverse heritages, and a desire for varied food and experiences. The co-founders saw the $109 billion gourmet food industry as ripe for disruption. Their research found that over 50% of Americans purchased gourmet food, but there were few options to do so online. What if consumers could sample gourmet foods before they purchased them? Armed with an innovative business idea and solid experience, Try The World started with funding from angel investors and the Eugene Lang Entrepreneurship Center at Columbia University. Like most startups, Try The World began with a great idea but needed to prove there was a market fit via a Minimal Viable Product (MVP). In early 2013 the startup participated in an incubator at Google, and they created a MVP by purchasing gourmet food items at international retail stores in New York. The boxes sold out within two days. Validating their product idea was only the beginning. The co-founders’ goal was to source directly from producers around the world, but first they had to learn how the entire supply chain process worked. After their MVP success, the next step was working with importers to source products. The fledgling company didn’t have the money to fulfill the importers’ minimum order quantities, so the co-founders had to convince importers about the company’s growth potential before the importers agreed to fill the smaller orders. Eventually, Try The World was able to work directly with producers. However, working directly with producers meant the company had to figure out all the logistics related to importing products into the U.S., including FDA compliance and clearing customs. We very quickly realized that our success would lie in our ability to scale the business. So, we put processes in place that enabled Try The World’s co-founders and managers to really focus on growth. While the co-founders manually put together the MVP, they quickly partnered with a fulfillment center to put together the subscription boxes. The early Try The World team created processes to help streamline everything from customer feedback and support to subscription billing. “We didn’t want to devote resources to building something from scratch. Chargify was one of the first all-inclusive subscription management solutions and it just made sense for us,” says Vorotova. In the early days, Vorotova and Foult examined all customer reviews and support tickets themselves. Being able to see direct and honest customer feedback was very beneficial as they grew the product, but it quickly became very challenging to respond in a timely manner. The co-founders didn’t expect the massive onslaught of orders and questions they would receive during Try The World’s first holiday season. “It was all hands on deck! Everyone pitched in to answer phones, emails, and chats,” remembers Vorotova. The result was a good team building experience with everyone pitching in to help the company have a hugely successful holiday season and better forecasting of staffing needs to address customer tickets at different times of the year. “With Chargify it is easy for anyone on the team to login, see relevant subscription information, and to help customers very efficiently. At the same time, Chargify’s PCI compliance security and access controls protect our customers’ private information,” she explains. Try The World also looks to Chargify’s analytics to track key metrics and spot trends. Chargify’s analytics are great! We’re able to view and track our signups, churn, current active base, how we’re tracking, what the trends are, and more. This transparency allows us to understand the health of our business, speed up decision making, and operate more efficiently. Talking with Vorotova it quickly becomes apparent that Try The World is much more than a subscription box, and it has been from the very beginning. It is an entire cultural experience. Every box includes a Culture Guide. The guide is “a big component of the experience because it’s not just the food that you get. It’s also the stories of the artisans and how to use the products,” explains Vorotova. 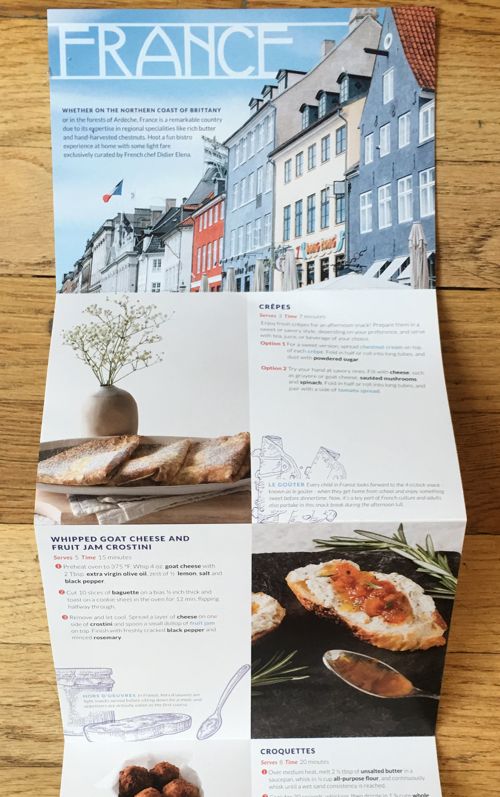 Partial view of the Culture Guide for the France country box. Early on, only chefs who loved the concept assisted with curating boxes. As Try The World’s exposure and reputation increased, their sourcing also became easier. Now, Michelin star winning chefs frequently help curate boxes. Ministries of export, tourism boards, business associations, and airlines also saw the potential and began to proactively reach out to the company for inclusion. The above process is only a high-level snapshot. Each of those steps involves substantial detailed coordination with suppliers, compliance with regulations, and arranging of international logistics. Vorotova’s advice for anyone looking to start a subscription business is to be clear about how you’ll differentiate your business from others. 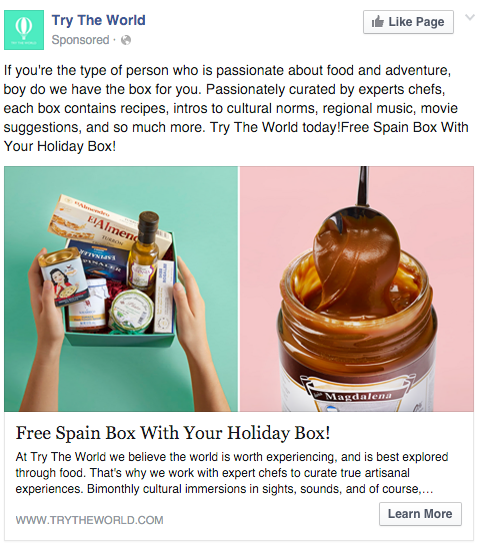 Providing a cultural experience in each box is only one of the ways Try The World created a unique product. 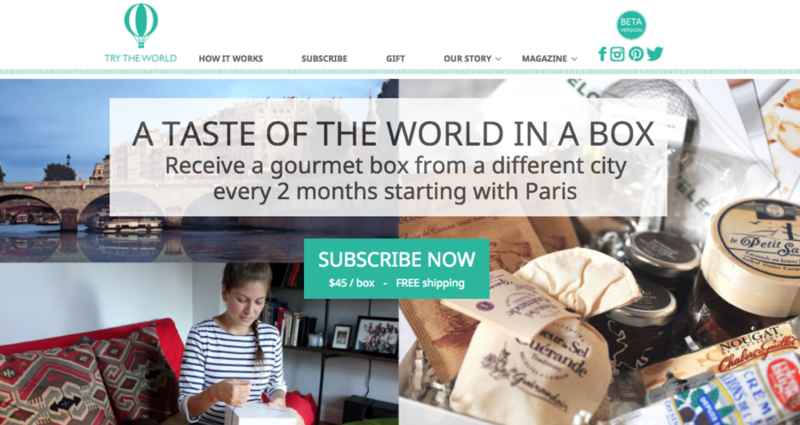 Their approach to sourcing is a differentiating aspect that sets Try The World apart, not only from other food subscription boxes, but also from other companies importing international gourmet foods for sale in the U.S. market. Due to their unique sourcing methods, Try The World is bringing approximately 50% of the items they source to the United States for the first time. In those cases, Try The World is the exclusive distributor of those items. The other 50% of the products are very challenging to find in the U.S.
One of the best parts for Try The World customers? By working directly with producers, the company cuts out expensive middlemen and passes the savings onto customers. Which means customers can enjoy gourmet international foods at affordable prices. The company is proud to have introduced more than 5 million products from over 30 countries to hundreds of thousands of American customers! Try The World initially built up exposure by targeting millennials on social media. Their visual products portray well in images and videos so they focused on Facebook, Pinterest, and Instagram. Part of scaling the company was the development of an in-house algorithm that A/B tests hundreds of images and copy combinations posted on social channels. Based on the algorithm’s results, they optimize for the best performing social media posts and ads. As their subscriber count has increased, so have the product offerings. 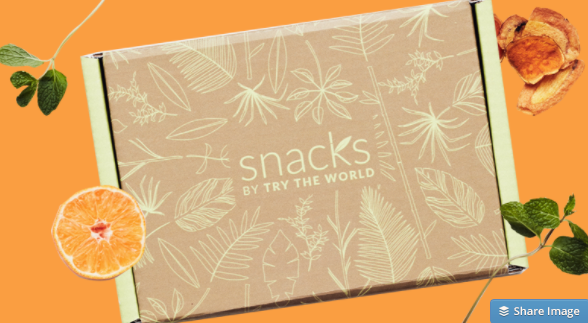 In addition to the monthly Countries subscription box featuring several products from a specific country, they’ve added Snacks by Try The World — a subscription which includes 6 snacks from 6 different countries, delivered every month. 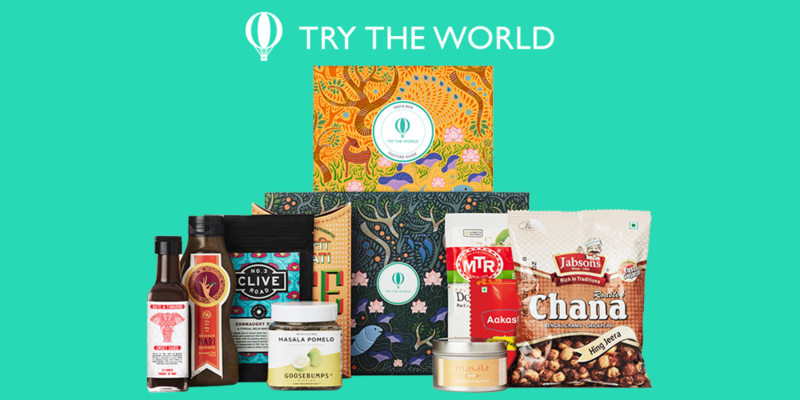 The Try The World online store provides customers the opportunity to purchase products they were introduced to in one of the boxes or discover new products for purchase. There is even a Try The World magazine! Articles include additional recipes, suggested Spotify playlists for featured countries, video interviews with chefs who curate the boxes, and more. In 2016, the company was one of 12 brands selected to be part of a holiday shopping experience produced by Westfield Malls in the Oculus at the World Trade Center. 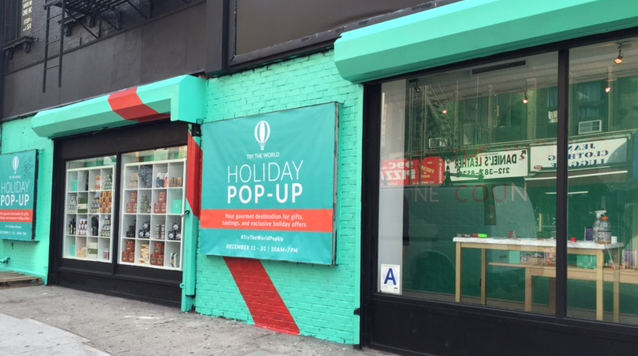 Oculus architect Santiago Calatrava custom designed each of the 12 pop-up holiday shops, and Try The World’s location “was right in front of the Apple Store so the foot traffic and exposure was incredible,” says Vorotova. Early this year they acquired Hamptons Lane, “the only competitor positioned as a curator of food experiences around the world.” According to Try The World, because Hamptons Lane was the only competitor focusing on global foods it made sense to consolidate the market via acquisition. Differentiating themselves by being the only U.S. company to integrate producer, importer, and retailer all-in-one has allowed Try The World to expand through new distribution channels. The company recently announced a partnership sourcing and distributing global products for Walmart, through their Jet.com eCommerce platform. The partnership allows Try The World to further their objective of providing authentic global foods conveniently and at affordable prices to U.S. consumers. With all this growth, what’s next? After reading about the company’s innovative business model and explosive growth, it should come as no surprise that the co-founders have even bigger plans for Try The World. Over the next two years the company is focused on growing its marketplace. According to Vorotova, this will include further expanding Try The World’s selection of products, including new categories. Currently, all the items available in the online store have been featured in current and previous subscription boxes. “The future vision is to expand our online marketplace offerings to include additional interesting and unique items from around the world,” she says. The first expansion will be happening within the next couple of weeks, and international cheeses will be available in the online marketplace. Soon, they’ll also add wines from around the world! Try The World has managed to disrupt the U.S. gourmet food market, experience massive growth, and create life-changing partnerships with companies around the world in a few short years. Their innovative sourcing and business model stand as an example to other subscription businesses looking to differentiate and succeed. To learn more about Try The World visit trytheworld.com.